SignatureForum is an independent consumer advocacy group and that uses actual customer feedback and exclusive survey results to rate and certify service providers in the fields of cosmetics, home remodeling, and health clubs. Professionals that obtain the SignatureCertified™ mark have consistently achieved an above average review from the customers they serve. Over the past ten years, SignatureForum has helped over 350,000 guests schedule appointments with lifestyle service providers in the United States and Canada. We help our guests select service providers that fit their initial needs for aesthetic, home, and health and fitness services. Using the resources on our sites, guests can research local professionals and schedule private consultations with one or more participating service providers in SignatureForum's national network. Once a consultation is set, Signature Forum stays in contact with the guest via follow-up surveys and questionaires, all in the effort to get an accurate and evolving picture of their service provider's level of skill, knowledge, and professionalism. All of SignatureForum's collected survey results are then automatically tabulated into an overall report card for each professional in the SignatrueForum network, using a traditional 1-10 ratings system, with 10 being the highest level of customer satisfaction possible. This rating is shared with the public, with original surveys available (in their entirety) for guests who wish to become SignatureForum members. Where Do the Rating Numbers Come From? Through follow up surveys, one-on-one correspondence, and online review submissions, SignatureForum has collected a wealth of data on the hundreds of service providers in our national network. With this data, we have developed sophisticated algorithms that are based on real consumer wants and needs. Due to this carefully constructed SignatureCertified™ 1-10 rating system, SignatureForum's endorsement of each service provider stands as an accurate representation of our guests' satisfaction. 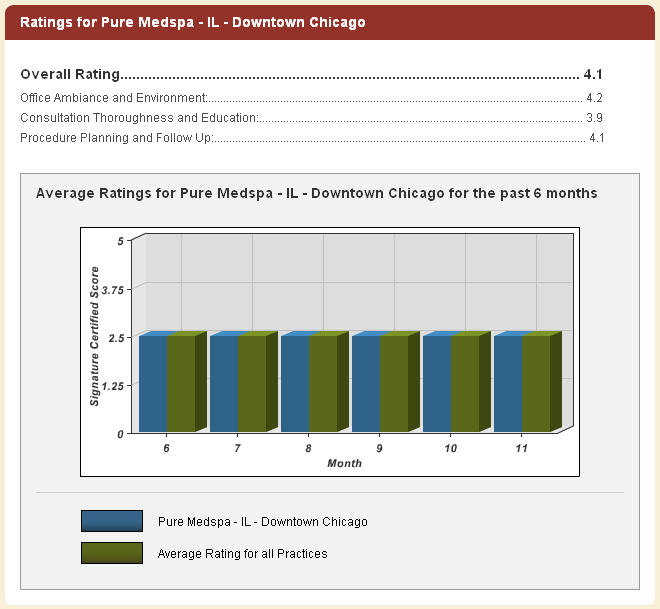 In addition to the 1-10 rating of our service providers, members can also view ratings based on other important criteria. For example, members researching medical spas or plastic surgeons will not only be able to view each doctor's overall rating, but will also be able to view other guests' opinions regarding the affordability, punctuality, and professionalism of each cosmetic specialist. Guests can also read and share reviews of specific cosmetic treatments, home improvement projects, or fitness routines on the SignatureForum site, free of charge. These reviews enable guests to directly assign a 1-10 rating to a certain service they've experienced, and to discuss that service with other guests. Guests also have the option of identifying the specialist that administered the treatment or handled the project. In these cases, their rating is added to the overall statistical analysis of that service provider, as well. Upon subscribing to SignatureForum, members are eligible to gain access to SignatureForum Service-Wide Graphs. Simply put, these graphs allow members to gauge whether a given service provider is living up to a quality standard of service in its industry. As an example, members interested in a particular home contractor can access graphs showing how that specific contractor stands up to similar providers all across the country. Because this graph tracks ratings over time, members will be able to determine whether a provider has improved their level of service over time, or if their ratings have gotten worse. No other website provides access to the same caliber of detailed, useful information on lifestyle service providers. In short, SignatureForum gives you confidence and peace of mind, so you can find the right specialist, the first time around. Compiles and reports on the survey scores and measures. SignatureForum ensures that this quality assurance system has integrity. All consultations are confirmed and the surveys are legitimate.